Oh and how much I love my big polka-dot cup of buttons. I've always collected buttons and their possiblitilies are endless aren't they? Have your used buttons for adorable projects like this one I found at Ameroonie Designs? 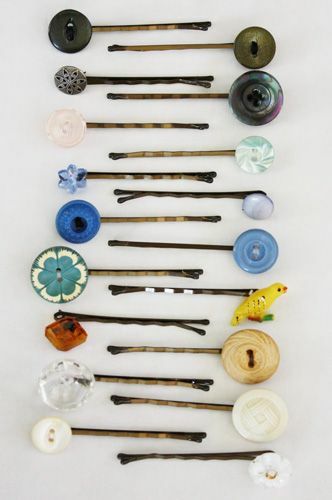 Maybe you've used your buttons for more crafty projects like these original hairpins? I recycled buttons from my husband's old work pants to create this snowman's quirky smile. I also love buttons. That framed rainbow quilt/embroidery is so sweet. I have a couple of collections from my grandmothers and mom. Love your rainbow piece--what a happy sentiment! Love buttons! Your snowman quilt is so cute!